Mark: Hi, it's Mark Bossert, producer of the Pawlik Automotive podcast. We're here with Mr. Bernie Pawlik. Pawlik Automotive, in Vancouver, British Columbia, Canada. We're experiencing winter starting. It's raining here, and of course, Pawlik Automotive are 19-time winners of Best Auto Repair in Vancouver, as voted by their customers. We're talking cars this morning. How you doing, Bernie? Bernie: Doing very well even though it's raining. Mark: So we have a 2005 Jeep Liberty diesel, that had a no-start problem. What was going on with this vehicle? Bernie: The owner of the vehicle had pulled over his vehicle, it was running fine, stopped to do something. Went to start it. Turned the key and it wouldn't start. All the lights came on in the dash, but when he turned to the start position nothing happened. So had the vehicle towed in, and we proceeded to do some testing and diagnosis. Mark: What actual testing did you do to find the cause? Bernie: Well, look, of course the first thing with a no-start issue is to make sure the battery is in good shape, so we tested that. And it was pretty apparent that everything ... The battery was good, everything seemed to be working but there was no starting. The starter wasn't working, so I thought maybe the starter's the first thing to test, and it's relatively easy to access on this vehicle so we tested the power in and out of the starter and the solenoid, and the various wiring tests we do, and verified there was no power getting to the starter solenoid. So we knew the problem was somewhere else. There's relays, there's wiring, there's an ignition switch; these are all the other components. So we proceeded to test all these items and basically narrowed it down to a problem inside the ignition switch area. Mark: With a diesel, is there anything different within that system, starting system, that's different than other fuel type engines? Bernie: No, actually, the starting system is exactly the same as a gasoline engine. The only difference with a diesel is that usually they have a much more robust starting motor, because the diesel has a much higher compression, so it needs a more powerful motor to start. But if you look at the starter motor it doesn't look particularly large in comparison to a gasoline starter. It's kind of the way modern technology with starters has gone. They used to be ... you could notice a diesel starter was substantially bigger. Nowadays they look pretty much the same size, so they pack a lot of power in to a small space, but the actual electrical system and the starting system is exactly the same. Mark: Once you narrowed it down to the ignition switch area, what was the actual cause? Bernie: Well, what we found was there's actually an actuator pin, or coupler assembly, in between the ignition switch and the actual electrical portion of the ignition switch and the lock cylinder. Usually within the ignition switch you have the lock cylinder, the place you put the key, and then that usually connects to the switch, the electrical part. And in this particular vehicle there's actually a coupler that goes in between the two pieces, so we'll just get in to a little picture show here, and I'll show you what's actually going on. There's our jeep in the shop after repairs, and that's the coupler piece that's broken. This sits inside the steering column. There's the ignition switch, the part where the key sits over in this part here. Bernie: Yeah, that's right, yeah. Sits over here, and then there's a little slot that fits inside this metal barrel here, and this connects over here, and then this, the ignition switch, the actual electrical part, clips on to this portion here. Now I've two arrows here. The yellow one shows a little metal piece here, and if you notice, where the red arrow is, there's not a metal piece. Well there's supposed to be one there. What happens is this actuator pin, the metal piece breaks, so when you the key it wasn't actually allowing it to turn quite far enough to actuate the starter. So that's basically the issue, so this part is the piece that needed to be replaced. And interestingly enough, it's amazing how cheaply built this part and component is, and everything kind of snaps together. It's plasticky and cheap, and I just sort of reflecting while I was working on it, how this is kind of at the time when Chrysler and Mercedes were married. You know, two companies. You couldn't really build different vehicles. I mean this stuff, it's made cheap and simple and snap-together, and if you look at a Mercedes, it would be much different in assembly. It's amazing that corporate marriage lasted as long as it did, because really very different building philosophies for these vehicles. Just a little side-thought there. Mark: Is this an easy repair? Bernie: Not really difficult. I mean, the diagnosis took a while, just to figure out where the actual cause of the concern was, but the repair itself is not all that difficult. However, as far as parts go ... that part we ordered a replacement after-market part, but if you go to a Chrysler dealer they'll sell you the whole steering column. So there are after-market parts available, you can just get that one piece, but if you go to Chrysler you're going to spend an awful lot of money on replacing that, and a lot of extra labor. Mark: Good to know. Once back together, I guess everything started properly? Bernie: Yeah, it worked fine. Worked great, just like it should. Mark: Is this a common issue on a certain range of Jeep Liberties? Bernie: Well, this is the first time we've actually replaced this particular piece, but it, as I mentioned, there's an after-market part available for it, so once somebody makes a part like that it's a pretty common problem. It just, for some reason it's the first time one of these has come in to our shop, and after ... it's a 13 or 14 year old vehicle at this point. But the owner had said that this problem had happened previously in the past, too, and he'd spent a lot of money at Chrysler having it fixed, so I assume he got the full steering column treatment, but it didn't last a whole lot longer. Sometimes when you look at a part, and you go, "Why did they build this so poorly?" Mark: So do other models of Jeep use this same full Chrysler steering column treatment repair? Bernie: They do, actually. So this part actually will fit a variety of Chrysler vehicles. Not just Jeeps. Everything right to Neons, and it's used in a variety of different vehicles from 1995, all the way up to 2007, so again, it's a common part and it may be if you have the same issue, that's that's the cause of your failure, but without testing things properly it's impossible to know, because there's so many other things that can cause it, but it's definitely a good place to look. Mark: Now, what was this part called again? Bernie: It's called an ignition actuator pin. Mark: So there you go. If you're having some starting issues with your Jeep or Chrysler product in Vancouver, the guys to see are Pawlik Automotive. You can reach them at 604-327-7112 to book your appointment. You must book ahead, they're busy. Or check out their website, pawlikautomotive.com. You can see our YouTube channel, Pawlik Auto Repair. Hundreds of videos covering all makes and models of cars on there, and thank you so much for listening to the podcast. Thanks Bernie. Bernie: Thanks Mark. Thanks for listening. Thanks for watching. Mark: Hi, it's Mark with Top Local. We're here with Mr Bernie Pawlik doing the Pawlik Automotive podcast this morning. How are you doing this morning Bernie? Mark: So we're gonna talk about a Jeep Liberty this week, and you had to do an engine replacement. What was going on with this Jeep? Bernie:The vehicle came to our shop.Towed in. 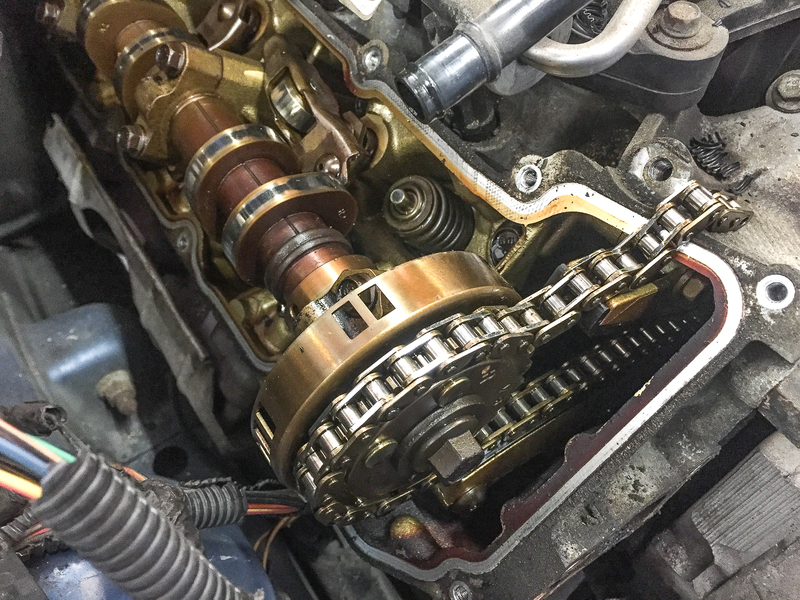 Suddenly started running really rough and the owner had thought there was something wrong with the timing chain, so that's the process we took with the vehicle, looking at it. Bernie: Well first of all, we went to see if we could start the engine, and of course scanned the vehicle for stored trouble codes, and we were able to start the engine. It ran really rough, but it did actually run and with the owners concern about the timing chain being a problem, we of course listened to see if there was a timing chain issue, and we couldn't hear any rattling or any noise of any sort. The engine was actually quite quiet other than it ran rough and there was a stored trouble code P0340 for camshaft position sensor circuit problems so we looked at things in that area. Bernie: Well we found, eventually, what we found was that the timing chain had broken but in the interim, it was an interesting diagnosis because the camshaft position sensor is located on the right cylinder bank and there isn't one on the left. A lot of newer engines would have two of them but this older engine just has one. And with that cam sensor code, it looked like it might be an electrical issue at first but we did verify it electrically as working. Eventually, we pulled the camshaft position sensor out, looked at it and we could see the camshaft itself was not rotating. So interesting that it would set that particular code with that description when it's not in fact a circuit problem at all, it's just that the sensor wasn't picking up a signal. Mark: And why would the cam gear or the cam shaft not rotate? Bernie: Well that's what we wondered and because I figured that this engine's actually running, it would be surprising that the cam would in fact not be turning. So we removed the valve cover and found that actually the timing chain itself was broken. Which explained a couple of things, the owner had said " I think it's the timing chain," and we ran it for a while, tried to verify it and couldn't hear a timing chain rattle because usually if there's a timing chain problem, there's always a noise, but finding a broken chain was a really unusual, an unusual find. Mark: So that's not something that you see very often, broken timing chain? Bernie: No, as a matter of fact, I can't even think of the last time I ever saw one. I mean timing belts will break because they're rubber and they crack eventually and break, but a chain, it's a piece of metal, it's very, very, tough and very robust. A lot of time the guides will break, the chain will jump teeth, but to actually have a chain break, I can't even think of the last time I saw one. Mark: And so was there any other problems that were going on? Bernie: Yeah, so, let's get into looking at a couple of photos here, here's our engine. This is the right cylinder bank with the valve cover off and you can actually see the timing chain. I've actually taken the timing chain piece out, this doesn't normally sit over here, it would be actually inside the engine. There's one piece of it, but this is why it was ... the rest of the chain is broken and stuck inside, but you can also see, there's supposed to be a rocker arm sitting here. It was actually lying loose, I just placed it here, but this rocker arm had popped off. So what we found had happened was the ... I'll just get the other photo here, the intake valve seat on cylinder number one had actually dropped out of position and this is a problem that happens on these engines. The valve seats will actually come loose and it jams the valve. It'll jam the valve in the open position, the piston comes up, smashes the valve and I think in this case, what happened is that this all happened probably in one foul swoop and broke the timing chain. So these arrows here, the red arrow ... Unfortunately this isn't the greatest picture; it's a smartphone picture, looking down at an intake port which is the valve's a couple of inches away from where the camera was taking the picture, but it's the best I could do with this camera. This is the intake value here, this piece where the red arrow is pointing. The yellow points to the valve seat, and the blue points to where the valve seat is supposed to sit. So you can see this thing here, this dark area here, is actually supposed to be up higher. So that kinda shows in a nutshell what happened with this engine. Mark: And which engine is this? Bernie: Yeah, glad you asked, it’s a 3.7 litre V6. It's an overhead cam engine, gasoline. We do work on a lot of these with diesels for some odd reason, but yeah this is a gasoline motor. Mark: And so the valve seat's dropped out, so that sounds like a pretty serious concern. Bernie: It is and it does happen on these vehicles from time to time, it's actually one of the flaws of this engine and also the 4.7 litre V8 which is basically the same engine only with two extra cylinders. So this is a common problem with that line of engine. Mark: So that's pretty catastrophic and compounded kind of things. How did you repair this vehicle? Bernie: So we ended up getting a good used engine for this vehicle. That was the cheapest way to go. Doing a full rebuild would be very expensive and far beyond the value of the vehicle. So we got a good used engine, and ran great after we put it in. Mark: And I guess was the piston compromised and the cylinder and all that? Is that why that it was gonna be more expensive? Bernie: Well in order to repair it you'd have to do the timing chains, I mean at the very least, the timing chains, get the valve seats replaced, and you'd wanna do it on both cylinder banks because if one's dropped out, there's gonna be another one coming pretty soon. 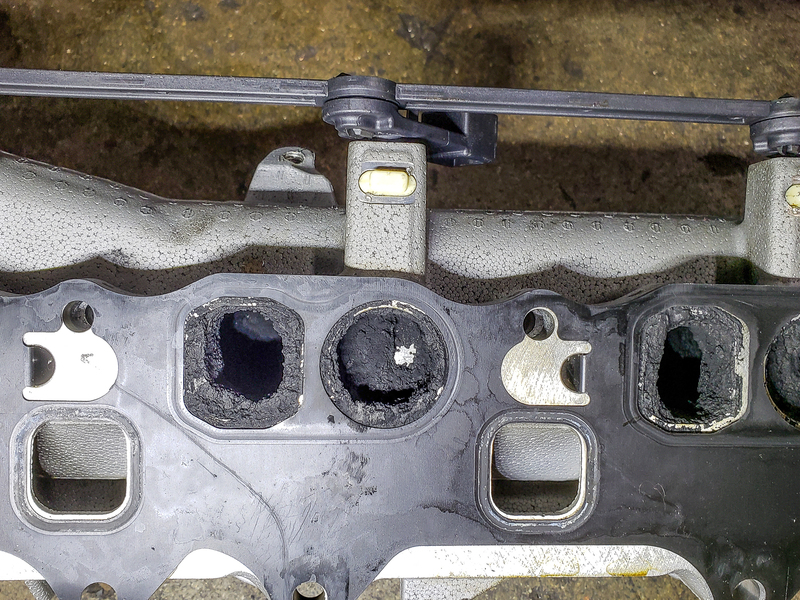 So in order to do all that work, it would far exceed the cost of even replacing with a used engine and at that point ... we never took the cylinder head off and looked at what damage happened to the piston. To break a timing chain, who knows what else has actually gone on inside the engine, so it would be pretty expensive to fix. Mark: So normally, how reliable are Jeep Liberty's in this kind of timeframe? Bernie: Well, obviously with this podcast, you've seen some of the worst stuff that can happen, the drop valve seats, and we've actually seen this happen on other Liberty's and not had this kind of catastrophic failure, so it doesn't always result in this particular problem. But timing chains do wear on these things. Valve seat drop out, that's probably the biggest issue. They're not the most reliable vehicles, there's a lot of little things that happen to them; it's not a Toyota. Toyota always seems to be the benchmark I go back to, but they are pretty decent vehicle for off-road but they have this little nit-picky things that happen. The engines are not the most fabulous. There's diesels, we talk a lot about those on our podcast, and they have their issues too. Personally, I'd go for the gas motor, just definitely more reliable than the diesel in spite of these problems. Mark: So there you go, if you have an older Jeep Liberty or a newer one, or any kind of Jeep, the guys to see in Vancouver are Pawlik Automotive. You can reach them at 604-327-7112. Get your vehicles maintained regularly and they will last longer. You have to call to book ahead because they're busy or check out their website, pawlikautomotive.com We're on youtube, search for Pawlik Auto Repair, hundreds of videos on there showing repairs of all kinds of makes and models of vehicles. Hopefully you're enjoying our podcast. Thanks Bernie. Mark: Hi, it's Mark. I'm here with Bernie Pawlik, Pawlik Automotive in Vancouver. We have doing the Pawlik Automotive podcast again. How you doing this morning, Bernie? Mark: So, we're going to be talking about a Jeep Wrangler Unlimited that had a problem. What was going on with this vehicle? Bernie: We'll start right with the vehicle and this is the vehicle right here, 2008 Jeep Wrangler Unlimited, and what was going on with this vehicle? There was a number of issues, actually. It came in for an inspection. We looked at a few. We looked the vehicle over, found a number of front-end issues, worn out brakes and a few things, but the primary purpose for this podcast is to talk about the front brake hose that was in bad shape. So, there is the brake hose. If you can see, this is ... so this is on the front of the vehicle. This is the shock absorber and the brake hose. This is a pretty close up shot. This brake hose runs from the frame of the vehicle up here, out to the brake caliper over in this direction off the screen. You can see this leaky stuff, this kind of gucky, rusty stuff and this split piece of rubber here, that is the brake hose that is about to explode. What's happened here is basically the metal has started to fester and losing its grip on crimping the brake hose. Basically, a lot of it just caused by rust. It's just corrosion that's expanded the rubber, torn it apart, and then eventually caused a leak. Mark: So is that the main reason for a brake hose to deteriorate like this, rust? Bernie: Well, this is one reason. We actually don't see that all that often around. We're in Vancouver. The weather is pretty mild here. We don't get a lot of road salt. This vehicle is from Alberta. There's a lot more road salt used in Alberta. The winters are harsher. And so, that basically ... the salt and moisture just ends up creeping in behind this piece of rubber here which is sort of that ... there's an protective shield, kind of creeps in there, sits in there over the years. It's 10 years old. It just eventually starts to corrode the metal, it expands. As I said, it would ... it just loses its grip on that. It's a high pressure crimp on the rubber hose. Mark: And so, is this like an accident that's waiting to happen? Bernie: Absolutely. I can't say enough. We often talk get your ... I mean, we often tell people get your vehicle inspected once a year. I mean, not you own a vehicles only two, three, four years old. It's probably not that necessary. But once it gets on in age, really necessary to have a vehicle inspected every year because you never know what's ... what you're going to find next year even though things can be fine now and you may only drive 5,000 kilometres, there's ... things happen over time, things deteriorate, rust and corrosion just starts to get into places and it'll start working its way through stuff. So, what looks good now, even a year later, even if you don't drive a lot can often amount to problems. So this is why you always need to have an inspection because you'll never see this until it breaks and seeing an accident waiting to happen, when a hose like this breaks, usually it's fine until you hit the brake really hard which is a panic stop, usually. And then I'll assume the hose just bursts because the pressures too high. That's that's when you do not want your brakes to fail. This is when it will. Mark: Again, this isn't something you find all that often? Bernie: We don't find this all that often around here. I'm certain that if you ... place like Alberta, Eastern Canada, the US, places where there's lots of road salt, you'll find this kind of stuff, this kind of corrosion happens a lot more often. We do find brake hoses wear, they tend to crack and that ... that's kind of the wear we find here, but that usually takes at least 10 or 15 years before that kind of thing happens. Again, that's something we can spot on inspection it and fix. But this is almost more serious because if the failure can happen almost faster then it was just ... it's got a crack in it. Mark: So there are a few different models of four-door Wranglers. What are the differences? Bernie: Well, mostly, I mean, there's some more different trim packages but the main difference ... like this is an Unlimited Wrangler, some of them have cloth seats. This was really nice. It had leather seats and really, really nice interior in it. But the main difference in the upgraded model is the Rubicon which is kind of cool. It's got locking differentials, like they electronically lock the differential. So, this is ... that vehicle is a true four-wheel drive. Once you lock it all in, it's ... all four wheels are pulling you whereas most four-wheel drives, you're kind of got, posy in the rear-end, you've kind of got a three-wheel drive, but this is like a true four wheel lock drive. So you can really go ... you can really go places. So it's a pretty cool vehicle, little more complex, a lot more stuff to go wrong and things do with the differentials. But other than that, that's kind of the main difference, Rubicon or the sort of not Rubicon. Bernie: Well, it doesn't say not Rubicon, the plain Unlimited, the more base model. They still all go well out in the bush but the ... if you really want the best, get the Rubicon. Mark: What other issues do you see going wrong with Jeeps? Bernie: We work on a lot of them. I mean, a lot of front-end, the steering linkages wear out, which we replaced in this vehicle, ball joint, steering linkages. I mean, brakes wear is normal as you'd expect. There's more fluid services required because it is an all-wheel drive utility truck type vehicle. So, there's extra differentials and things that need service. People often drive them in harsher climate. So when you do that, more work need to be done and a few cooling system repairs here and there but other than that, they're pretty good. Mark: So there you go. 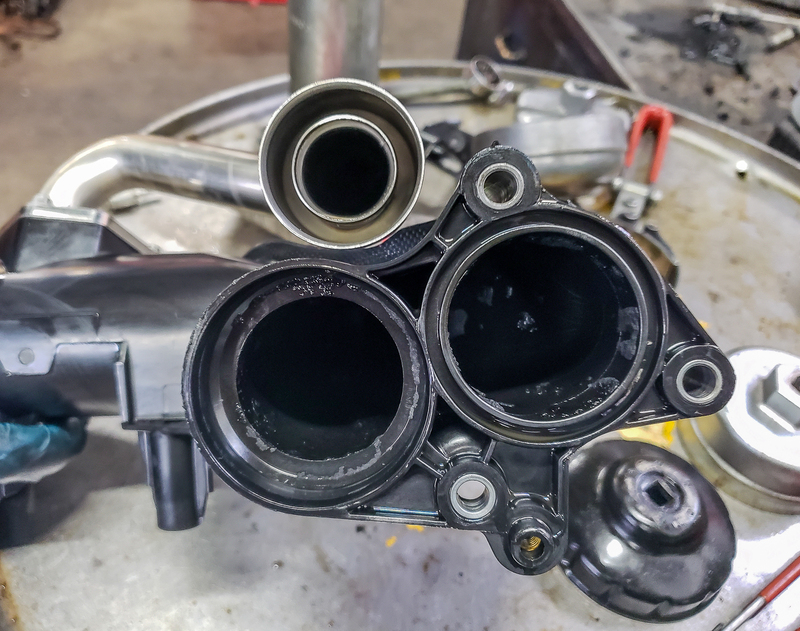 If you're looking for service for your Jeep or you have some concerns about having imported a car from Eastern Canada and maybe you need to have the brake hose checked, the guys to see are Pawlik Automotive. You can reach them at 604-327-7112 to book your appointment or check out their website pawlikautomotive.com, hundreds of articles and videos on there, or the YouTube channel which is the same, five-plus years of videos on there, or our new podcast on iTunes. Thanks, Bernie. Mark: Hi, it's Mark from Top Local. We're here with Bernie Pawlik, Pawlik Automotive in Vancouver, 18-time winners of Best Auto Repair in Vancouver as voted by their customers. How are you doing Bernie? Mark: We're talking about is 2005 Grand Cherokee. What was going on with this off-road vehicle? Bernie: Well the vehicle was towed to our shop with a no start condition and the engine wouldn't crank over, which we determined to be the starter motor and we replaced. It was also brought to us ... It was overdue for a maintenance service so we did our B service, which is an oil change, this includes an oil and filter change and a full vehicle comprehensive inspection. Mark: And what did the inspection find? Bernie: A few interesting things, but the one thing that I wanted to share and that is an air filter that is dirtier than any air filter I'd ever seen in my life. We'll just get straight to pictures here because this I pretty cool to look at. Actually I'm going to start with ... this is the air filter in the vehicle after it was cleaned. This is a K&N air filter. It's a reusable filter, supposedly a lower air restriction than a regular paper filter, and it's reusable. After a while, it gets dirty. You clean it with a special cleaner and you can apply a special oil film to it, and that does all your filtering. It basically lasts ... It's a lifetime type of filter. You can see, that's what the new clean filter looks like. Let's have a look at what we found, and that was this. Absolutely covered with a huge, thick layer of dirt. That's a close-up view of it. It's so thick, I honestly don't even know this engine was running with a filter this dirty, but somehow, it was. That's our air filter. Mark: Were there any other pressing services on this vehicle? Bernie: There was a couple other things. Ball joints were worn out. We replaced those. Also, the engine coolant, which actually I'll just re-share another photo while I'm at it here. The radiator cap, you can see there's a lot of rust and corrosion around this cap, so the cooling system was well overdue for a flush. Fortunately for the owner ... There was a lot of rust on the cap, which looked very concerning, but fortunately, the rest of the cooling system wasn't ... The coolant wasn't so badly rusted. 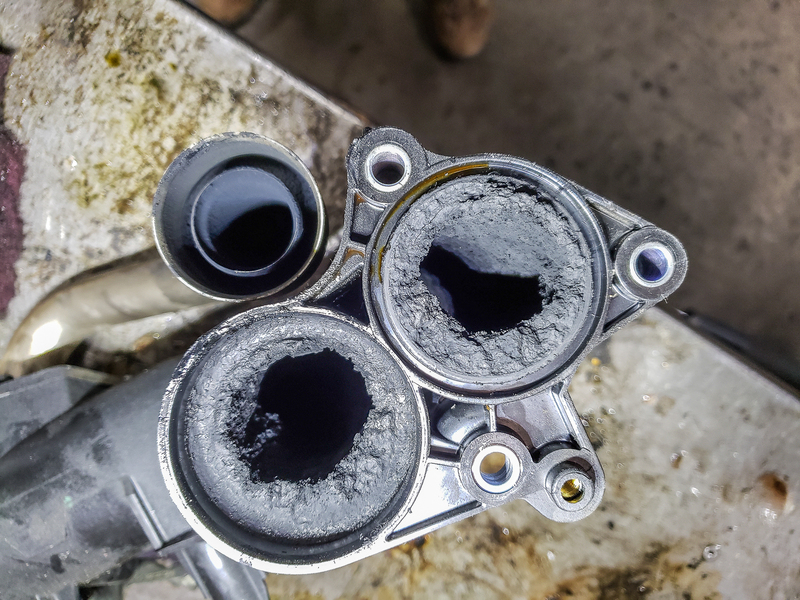 But once it gets really badly rusted, it's impossible to get rid of, so it's a condition you want to avoid by making sure you have proper antifreeze concentrations and you do flush your cooling system. It doesn't happen as much as it used to in the past, but we do see it now and again. Any engine that has a metal steel block or cast block will be prone to rusting. We did a cooling system flush as well. Mark: How is the 5.7 litre engine in this vehicle? Bernie: They're pretty good. I think they're one of the better choices in these vehicles. We do talk a lot ... We've done a lot of these hang-outs on Grand Cherokees with diesels. We do work on a lot of them, but the 4.7s and 3.7s are also popular. In the older generations, the 4 litre straight six, but the 5.7 is a good option. The only thing is it's a pretty large engine. It's got lots of power, but it's large, so you're going to use a lot of fuel. That's probably the downside to this engine. Other than that, it's pretty reliable and powerful. Mark: With that engine being that dirty, do you think that was a factor of being off-road a lot, or was it just not serviced often enough? Bernie: It was entirely off-road. This vehicle had a lot of dirt on it, which is great to see, because so many people buy these vehicles and they only ever see pavement, but that's the nice thing about owning a Jeep or a Grand Cherokee. It's a really good off-road vehicle. Yeah, no, this thing was used very well off-road and that's exactly ... You'd never get that kind of dirt. You'd have to drive maybe a million kilometres in the city to ever see that level of dirt. That's all off-road. Very dusty roads. The interesting thing is it's actually, right now, it's fall and winter time in Vancouver. It's been raining and wet for quite a long time, so that kind of dust ... It must have been on there, since summertime when the roads were ... There was a lot of dust on ... I imagine he drove on a lot of logging roads where he was getting a lot of dust. That filter's probably been dirty for quite a while. I'm not even sure how the engine ran. It's probably got another 50 horsepower after we cleaned the filter. Mark: So, there you go. If you're looking for service for your Jeep Grand Cherokee or any model of Jeep, the guys to see in Vancouver are Pawlik Automotive. You can reach them at (604)327-7112 or check out their website, pawlikautomotive.com, or our YouTube channel, Pawlik Auto Repair. Thanks, Bernie. Mark: Hi we’re here with Bernie Pawlik, Pawlik Automotive in Vancouver talking cars. How’re you doing this morning Bernie? Mark: So we’re going to talk about Jeep Grand Cherokees and how reliable they are, they’ve been around for a long time, how reliable are they? Bernie: Well let’s say they’re mixed. Yes they’ve been around for a long time, the first Grand Cherokee started in 93, there’s like basically four generation, 93 to 98, 99 to 04, 05 to 2010 and then 2011 to the present, actually realized that the present is 2017 so they’ve been making this style the longest of any Jeep so there’s bound to be a new one out pretty darn soon. Interesting thing, this vehicle is also, I mean most North American cars they never leave North America, but the Grand Cherokee is sold actually in Europe and in other places around the world so they’ve had some success selling it elsewhere. But I think one of the things that’s really hampered the vehicle is the Chrysler merger, well Chrysler has been a little bit of an unstable company for, if I can use that word, they’ve been trying to find their home so to speak for a long time. The Jeep was basically an American Motors product and Chrysler took that over so they’ve, you’ve seen the early American Motors influence in the early years of the Grand Cherokee, then Mercedes and Chrysler merged and you know created some stuff with that and they’ve gone their own way, and they’re trying to recreate themselves all along and I think that’s affected the reliability of the vehicles. Let’s do a quick share of some photos here, just a few different model years, so we’ve got, what’ve we got here, here’s your 95. This is the earliest, the early year of the first generation; we’ve got the next generation which is the 03, that’s an 03 model; and there’s an 09 so that’s the third generation and finally into the fourth generation, we’ve got a picture of a Jeep Grand Cherokee doing what it does best, driving through the snow. So there’s a few different, just got to stop my sharing, ok there I am back again, okay so yeah, those are the different Jeeps variety. Mark: Okay so what are some of the things that go wrong with them? Bernie: Well, I’ll talk about some of, a couple of the good things first. I think the engines are generally pretty good especially the earlier years, the four litre straight six engine is an excellent engine, extremely reliable and the V8 offerings, the 5.2, the 5.9 again pretty reliable and solid as well. We get into the early 2000’s generation then we’ve got the overhead cam V8 3.7 V6 and the 4.7 V8 there were some issue with those valve guides dropping out if you don’t change your oil often enough. These engine were not forgiving, there were timing chain problems and expensive to fix. But again, we have clients with them that have gone way over 200 thousand kilometres and still had no problems. And then you get into the newer generations, the engines again are pretty good, there’s the Hemis and there’s some good performance options available, the engines generally are pretty reliable and there’s also some diesel offerings in the last, sort of mid to late 2000’s, the Mercedes 3 litre diesel. A good engine but very expensive to fix when things go wrong so just something to watch with caution, may not be the best value. You really got to check it out whether it’s worth your while but you can buy a Jeep diesel for a lot cheaper than buying a Mercedes diesel so it could be a pretty good value. So other issues that go wrong, we’ve seem coolant leaks, it seems like a lot of things happen on Jeeps you know maybe before other vehicles where, we’ve seen transmission coolers leaking fluid into the radiator. 2011 Jeep Grand Cherokee seems to be one of the most years, there’s some electrical issues, there’s a part called a tip which is a total integrated power module. They fail suddenly, a lot of complaints for failures for these. We’ve actually not run into any ourselves at the shop, I shouldn’t say that, we’ve had a couple but you know, not as much when you look at the internet and how big of a problem that is. But that is a definite thing to watch for if you’re buying in 2011, this seems to be that that model year that is the worst. The brakes, being a heavy sport utility vehicle, brakes you get about 50 to 70 thousand kilometres out of brakes, also a bit of a gas guzzler too. That’s really not a reliability thing, but a lot of them, there’s large engines, all wheel drive, so they use a lot of gas. And another area where we see a lot of issues, heater cores, air conditioning system, leaking heater cores, again these happen when the vehicles get older but they’re expensive to fix on these vehicles. And my other criticism to things like I mentioned, a radiator leaking earlier, a lot of them they’re not simply designed, Chrysler sort of modularly put together the radiator and the air conditioning, the AC evaporator, they’ve sandwiched it all together, so to change the radiator, not a simple job in these vehicles, can end up being over a thousand dollars to do a rad job on a Grand Cherokee. So that’s a lot more than it used to be in the earlier generations. So those are some of the things we see. Mark: Lots of issues. What are your final thoughts? Bernie: Final thoughts, you know they’re a popular vehicle, people like them, I would say that when you get into one, even from the earlier generations, they’re nicely built vehicles, leather seats, luxury features in a lot of the models, so they’re attractive but you know when you compare it to say a Toyota Land Cruiser which is a lot more money, by the way, but a Land Cruiser or even a Forerunner, and again those are usually more money, definitely not as reliable. You know, certain things, we’ve serviced Land Cruisers with 400 thousand kilometres, they still need some work but they’re still more solid in reliability. So I like the Grand Cherokees but just be prepared to spend a few more dollars than you would on your average vehicle for repairs and maintenance. Mark: Hi, it’s Mark from Top Local, we’re here with Bernie Pawlik and we’re talking car repairs. How’re you doing this morning Bernie? Mark: So we’re going to talk about a 1995 Jeep Wrangler that had some brake repairs. What was happening with this Jeep? Bernie: Well the Jeep came to our shop for a comprehensive inspection and a look over, it had been a while since the owner serviced the vehicle and also there was, he had a few concerns. So through the inspection we found it needed some brake work so we’re going to talk about what we did on the front brakes this morning. Mark: Was this a routine brake job or was there something unique about it? Bernie: Well pretty much routine but there is one thing that is unique about it, that’s why I want to do a hangout about it. I’ll just start with sharing some photos here because it’ll be a good explanation as we go through. So this is a, it’s a little dark but this is a bracket, the brake caliper bracket and this is where the brake pads ride and when we took everything apart, you can see in this area here, there’s a big gouge. This is kind of normal after years of use and this vehicle is 22 years old, so it’s been around for a while but we see even on vehicles that are 5 or 10 years old. The brake pad wears in this area, it slides, it moves back and forth and creates a gouge. When this is worn it can cause clicking sounds in the brakes, it can also cause squeaks and squeals and just generally not a great feel in the brake pedal because things could get hung up. So what I wanted to talk about in this hangout is how we repair this particular thing. We basically, we have, so I’ll go to the next photo, this is the same bracket after it’s been repaired, it’s on the other side of the vehicle, it’s the top one, but this is the area where we repaired. This again had a big gouge in it. We welded it, filled in the missing metal and then ground it down, so it’s basically like a nice flat piece of metal now for the brake pads to slide on. And the final item here, this is the brakes put together, the red arrow points to that area of the picture there, so you can see, here are the brake pads, there’s a ear on the brake pads that slide in this bracket and that’s all been fixed so everything slides clean, there’s no excessive movement. We also apply our special orange, this is the sort of modern best brake lubricant available these days to any moving services, so it prevents any squeaks or squeals and everything works and lasts for a long time. Mark: Wow, being a ’95 this Jeep is getting on in age, how is it overall? Bernie: Really good. The thing about Jeeps is they’re one of those type of vehicles that seems to last for a long time. There’s certain vehicles where once they get to a certain age, I can’t remember the last time I worked on a 1995 Subaru, I mean they’re just gone you know, once they get to a certain age they just have no use. But Jeeps, I was actually surprised when I looked and oh it’s a ’95, it’s in really good shape, this one is unique too, it’s a four cylinder with an automatic which is kind of unusual and maybe not the most desirable but economical and easy to drive. Most of them are standards with straight 6 engines which are awesome. I mean overall it’s a great vehicle, still in really good shape, the owner’s doing a bit of work on it but works good and we work on Jeeps that are decades older than that. They can last a long time. Mark: Hi, it’s Mark from Top Local here with Bernie Pawlik of Pawlik Automotive in Vancouver; Vancouver’s best auto service experience, 16 time winners of best auto repair in Vancouver as voted by their customers. How’re you doing Bernie? Mark: So we’re going to talk about jeeps, we’re back into the land of jeep, a Jeep Liberty 3.7 liter. So this is a gas engine which is a bit different than, talked a lot about their diesel vehicles, this is gas, what was going on with this vehicle? Bernie: Well, this vehicle came to us for a maintenance service and an inspection so we had a look at the vehicle and found a few things, one of them was a coolant leak on top of the engine which was not a huge leak but definitely something potentially serious which is why we’re talking about that on this hangout. Mark: So was there a lot of coolant leaking? Bernie: There wasn’t a lot and the interesting thing is the way the coolant was leaking, you know the way because of where the coolant was leaking, it wasn’t a large leak and could never amount to a large leak but where it was leaking was what’s really the most important thing. I’ll just show some photos here, this is our actual coolant leak. So this is the coolant overflow bottle, it’s located on the right hand side of the engine compartment and it’s basically an expansion tank for the cooling system, this is where the radiator cap, it’s, it’s out of the frame off to your right over here but the radiator cap sits on top. This is where you fill the coolant, now the red arrows are pointing to what’s broken on this piece. There’s a very small diameter hose, it’s basically an air bleed supposed to keep air out of the system so it circulates coolant and where the bottom arrow here, is where this piece here is supposed to attach into the coolant bottle so what’s happened is this, this has actually created a coolant, a small coolant leak that spews coolant out. Now where this bottle is located on the engine is kind of the critical part. I’m just going to work my way through these shares here, so this is the result of that coolant leak and if you look down, this is the top of, this is the right cylinder bank of the engine, and coolant bottle sits on top, now all that reddish coloured stuff that’s dried up anti-freeze, Chryslers anti-freeze from the factories are reddish coloured so that, it ends up showing like this. Now around here we have fuel injectors, we have ignition coils, that’s kind of the critical piece, the ignition coils sit in this area here and coolant is dripping down on top of the ignition coils running down into the spark plug wells. We have one more photo here, this is, these are the spark plug, sorry these are ignition coils taken on that cylinder bank so you can see that these coils are, this one’s o.k. but these ones are covered especially this one in the antifreeze residue and its run right down into the spark plug tube and caused, created an engine misfire. O.k. Mark: So besides leaking coolant and you know potentially causing overheating problems, what other problems did this cause? Bernie: Well this was actually causing the engine a slight misfire, the sparkplugs in this vehicle were quite old and we replaced them but I mean, had it started leaking a lot worse the engine would have developed, definitely developed severe misfire and with coolant seeping into wiring connectors, it can cause damage as well so I think, you know this leak may have been going on for a little while but we caught it at a good time to fix it, so the repair, basically new spark plugs just based on age, cleaning up all the leaked coolant and the ignition coils and replacing the coolant bottle and we flushed the coolant system with fresh antifreeze as well. Mark: So how reliable would you say these gas powered Liberties are in comparison? Bernie: Comparison to the diesel is what you’re saying? Mark: Or into the, just into their competitors even. Bernie: Yeah, yeah I’d say these vehicles do have their issues, the engines have problems you know, we’ve seen timing chain issues with them, we’ve also seen one common problem with this engine and it’s a 3.7 liter V6 Chrysler, also uses a 4.7 liter which is basically the same kind of engine but it has two extra cylinders, it’s a V8 and not a V6. One common problem in these engines is the valve seats fall out which is, which involves some major engine disassembly and major expense so you know, overall they’re not the most reliable vehicles out there, there’s a lot of them and if you’re asking do we want, which is better the diesel or the gas, I couldn’t really say which is better but because the diesels are, the diesels have their engine problems and they cost a lot to fix so if you’re wanting a vehicle that doesn’t have any problems, this isn’t the vehicle to buy but they are nice little niche vehicle you know, their size and being all wheel drive. Mark: Anything further on the Jeep Liberty? Bernie: No, I’d say you know, if you’re looking to buy a used one definitely get an inspection done on it and just do your research and know these particular items, you know if the diesel you know the, you’ve seen our hangouts, there’s a lot of information on the diesel, the problems in the 3.7 liter engine which is the other offering, there’s issues with those so as long as you go in knowing what to expect then there’s no surprises and everything can be, it can only be better. Mark: And would you say with a vehicle like this that doesn’t have the best kind of record that regular maintenance is even more critical? Bernie: We it is for sure, regular inspections, regular maintenance definitely more critical. We just talked about timing chains on Acura’s in our last hangout, again these engines all have overhead, overhead cam systems with timing chains and so again regular oil changes are just absolutely crucial to the life of these engines, so yeah good maintenance is really important.